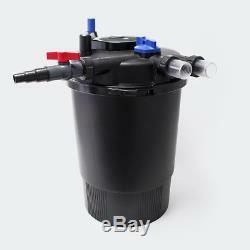 Grech CPF-30000 Pond Bio Pressure Filter with UVC 55-watt Up to 8,000 Gallons. 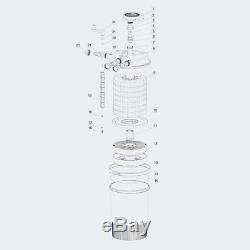 Biological and mechanical filter chambers for more efficient removal of dissolved and solid waste. Simple quick handle cleaning system for easy maintenance (no need to open and clean foams all the time). Enables rapid growth of aerobic bacteria resulting in removal of lethal ammonia and nitrite. UV Power: 55-watt, one lamp pre-installed, Max Flow rate: 12000L (3170GPH). Dimension: 17.5" x 17.5" x 27 tall. 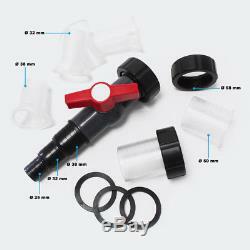 Hose fitting: 1.25", 1.5" & 2. The CPF-pressure pond filter series is among the latest generation of pond filters, combining in a compact system, a high-performance bio-mechanical filter along with the most modern UV technology. The filter is unremarkably dug in at the edge of the pond. The compact way of construction makes the pond technology almost completely disappear. Any and all connections as well as the whole field of technology are found in the top cover. 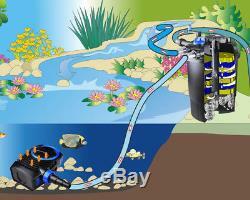 The pond filter can be dug in without any problems. The pond water can be pumped to higher-located waterfalls and from this point return into the garden pond. 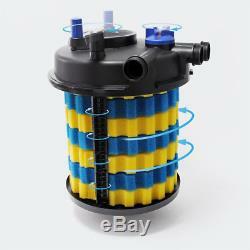 The pressure pond filter ensures a stable, biological balance and improves the water quality. 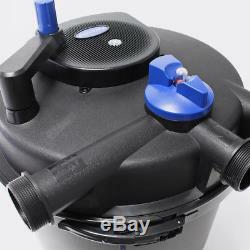 Along with the appropriate pump (not included in the supply; please note the pond pump´s maximum volume capacity), this ensures for clear water, thus creating healthy surroundings for the pond inhabitants. Operation Pressure pond filters with integrated UV unit are the combination of biological and mechanical filtration and contribute to the effectiveness by a UV-C pond clarifier. Due to their UV radiation, UVC pond clarifiers alterate the algae proteins´ tertiary and quaternary structure which causes their destruction. The algaes clump, thus forming large parts of particles that can be easily removed from the water circulation by the mechanical pond filtration of the pond filter. During the bio-mechanical cleaning microorganisms accumulate inside the filter and remove germs and bacteria from the water. 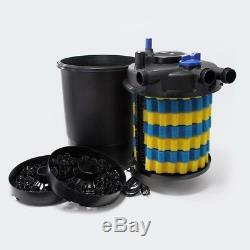 By the way of mechanical filtration, floating particles and dirt remain in the pond filter and do not return into the pond water. It takes about 4-6 weeks for the filter bacteria to settle sufficiently inside the pond filter. 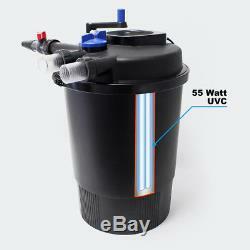 Only then it is reasonable to make use of a UVC-pond clarifier. The so-called initial "starter bacteria" help to reduce the time for a new pond filter to start its operation. Sometime you need wait 24 hours to see the real tracking info. Electrical Devices must be in its orginal packaging with all included paperwork. Fish Foods must be unused and sealed. We do require a return authorization number. Do not write anything on the box, please write on separate paper. QPOND is committed to honor and respect all of our customer's individual information and privacy. The information you provide will be secure and protected to provide you a safe and great shopping experience. Your mailing address information will never be provided to any other company for marketing or use. It is strictly for QPOND use only. Listing and template services provided by inkFrog. 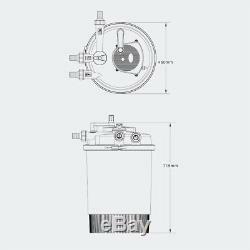 The item "Grech CPF-30000 Pond Bio Pressure Filter with UVC 55-watt Up to 8,000 Gallons" is in sale since Monday, April 16, 2018. This item is in the category "Home & Garden\Yard, Garden & Outdoor Living\Ponds & Water Features\Other Ponds & Water Features". The seller is "lotuspond2010" and is located in Hacienda Heights, California. This item can be shipped to United States, Canada, United Kingdom, Denmark, Romania, Slovakia, Bulgaria, Czech republic, Finland, Hungary, Latvia, Lithuania, Malta, Estonia, Australia, Greece, Portugal, Cyprus, Slovenia, Japan, China, Sweden, South Korea, Indonesia, Taiwan, South africa, Thailand, Belgium, France, Hong Kong, Ireland, Netherlands, Poland, Spain, Italy, Germany, Austria, Israel, Mexico, New Zealand, Philippines, Singapore, Switzerland, Norway, Saudi arabia, Ukraine, United arab emirates, Qatar, Kuwait, Bahrain, Croatia, Malaysia, Brazil, Chile, Colombia, Costa rica, Panama, Trinidad and tobago, Guatemala, Honduras, Jamaica.